On my way to Chikamanagalore, I saw that name - Halebidu - in many name boards. 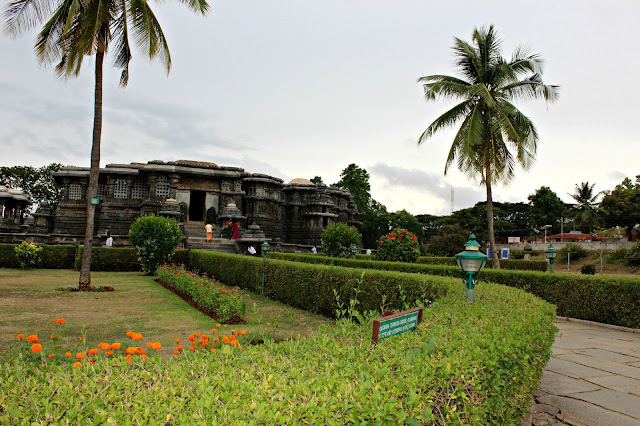 Halebidu – A name that seemed to ring a bell somewhere in my mind. But I can’t remember where. Ah! The Malayalam film actor - Mohanlal’s travelogue! I happened to come across it in some magazine. A place known for its soap stone architectures. A nice place to visit! Yes, I remembered it now! But, even though Halebidu was in my wish list, I didn’t plan to go there during this trip. By the time I reached my hotel at Chikamanglore, it was afternoon already. There weren’t much places that I could visit in such a short duration. So I was wondering what to do. Just then, my hotel manager recommended me two places to visit - Belur and Halebidu (Yes! The same place in Mohanlal’s Travelogue!) He then told me about the bus that will help me reach Belur. Eventually from there, I can get buses to Halebidu. It was at that moment, I decided to go to Halebidu. I took my bags and camera and started off to Halebidu. I told myself “Alright Halebidu! Here I come!” But as I didn’t know the way to the bus stand, the hotel manager sent his cleaning lady to help me. After waving goodbye to the lady who helped me, I got into the bus. I asked my co-travellers regarding the arrival time at Belur. But Kannada was starting to hinder my communication skills. However without much delay I reached Belur. It started to drizzle by then. Unfortunately, I missed the buses to Halebidu from the Belur station. So I asked the information center regarding the next bus to Halebidu. I got a lukewarm response asking me to wait for another 30 minutes to catch the next bus. Encountered with bad omens one after another, (drizzling and missing busses) I thought to myself “Hang on Halebidu. I’ll visit you today. No matter what!” With firm determination to visit Halebidu, I began racking my brain to make a decision – Should I wait for another bus or should I catch an auto to Halebidu? It was drizzling and it was getting dark. Also I had to go back tonight itself. But on the other hand, catching an auto would be costly and it could go beyond my budget! It’s just 30 minutes that I need to wait to get a bus… Finally, after two minutes of brain storming, I decided to catch an auto. So I started bargaining with the auto drivers in Hindi. In the end, an auto driver agreed for a round trip for 400 rupees. It started to rain when we started from Belur. But as we got closer to the “old city”, the rain gave way for this solo traveller. 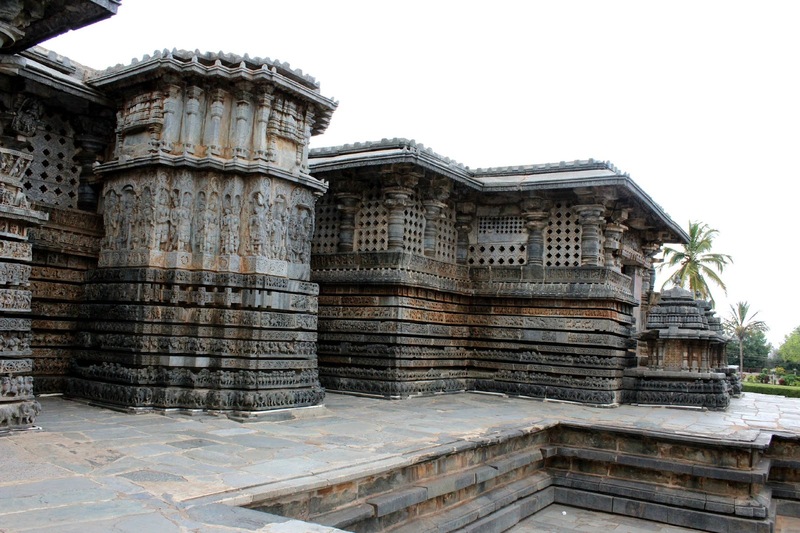 Halebidu was the capital of Hoysala Kingdom and it was ransacked by the two invasions of Malik Kafur. 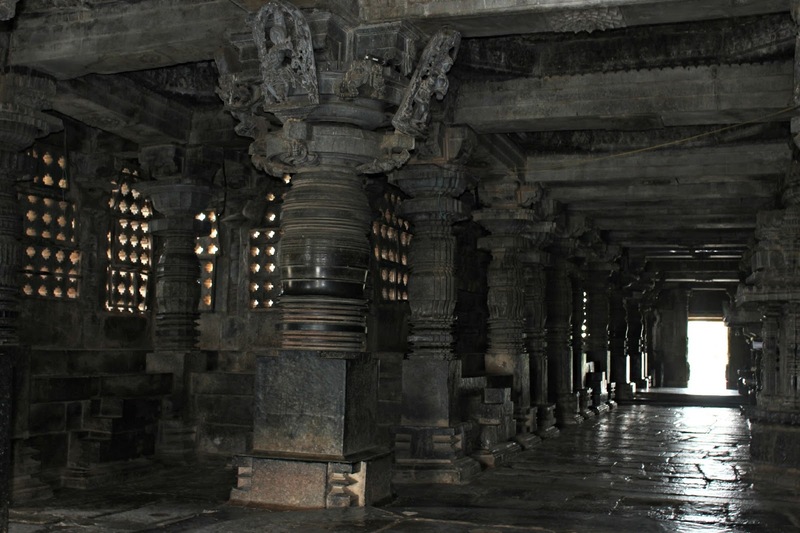 That's how it got its name “Halebidu”, which was previously known as Dorasamudra or Dwarasamudra. It's constructed with Soap stone. It has a temple complex with two temples, the Hoysaleshwara temple and the Kedareshwara temple. There was no ticket for entering the temple. When I stepped in, I could see a lot of kids who were selling guide books to the tourists. There were also some local guides who were waiting for their bait. Humbly and tactfully I ignored them. I took out my camera and snapped at the first best example of Hoysaleshwara architecture. It was cloudy. So the black thick sky added darkness to the soap stones. I walked towards the Kedareshwara Temple and paid 4 rupees at sandals keeper. After ensuring the safety of my sandals, I finally stepped into the architectural wonders of Kedareshwara Temple. The walls of the temple were covered with an endless variety of depictions from Hindu mythology, animals, birds and shilabalikas (also known as dancing figures). No two sculptures of the temple were the same. The temple compound had an archaeological museum that’s open till 5PM. But unfortunately, I was quite late. However, the Halebidu temple was open from sun rise to sun set and I could see the wonders in it too! That was how my visit to Halebidu turned out to be.